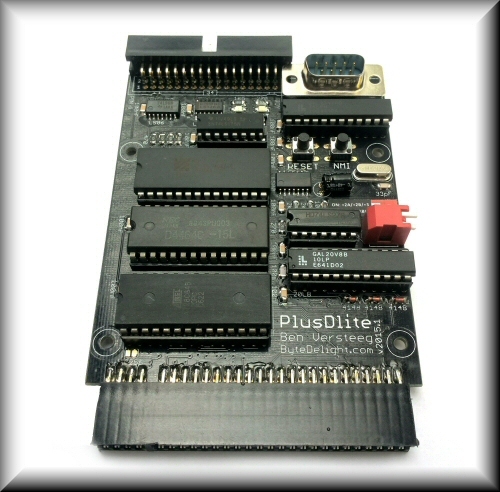 The PlusDlite is a floppydisc interface developed by Ben Versteeg (owner of ByteDelight.com). 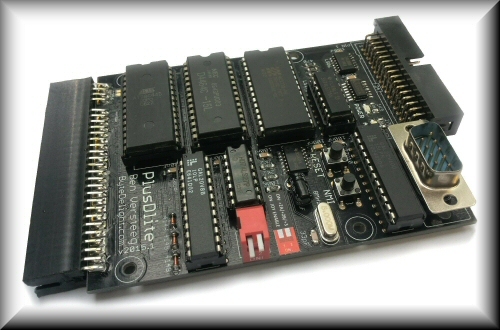 The PlusDlite adds the fun of using floppies on a ZX Spectrum, for a truly nostalgic experience! Now available in our webshop (click here)! There aren’t so many PlusD clones available, hence the PlusDlite was developed. Click here to read the PlusDlite manual. Currently a custom designed case (as available for the DivMMC EnJOY!) is not yet available, but this is planned (ETA: end 2015). Two Shugart compatible floppydrives can be connected to the PlusDlite, either 3.5″ or 5.25″, 40 or 80 tracks, single or double density, single or double sided. You can use ‘modern’ PC floppydrives (check the information below) or even a floppydrive-emulator. ByteDelight.com offers a nice set of Dual Floppydrives, check the webshop! When using (older) Shugart compatible floppydrives, you can use a straight 34 pin floppycable. Shugart compatible floppydrives have jumpers to configure the drive as DS0 or DS1. These traditional Shugart compatible floppydrives often need 5V and 12V. PC floppydrives (3.5″ HD 1.44MB) can be used too, and almost always need only 5V (1A) to operate. By default PC floppydrives are not Shugart but IBM PC compatible: they are configured as drive B (DS1) by default. To use PC floppydrives on a Sugart compatible floppydisc interface such as the PlusDlite, they must be configured as Ds0. Sometimes this can be done on the drive itself, but this is rare and almost always need a soldering connection change. The better way is to use a modified floppydrive cable. Be aware! Standard PC floppydrive cables with a twist of pins 10-16, can’t be used for a Shugart compatible interface such as the PlusDlite. To use a PC floppydrive as the first drive DS0 on the PlusDlite, a cable with a twist on pins 10-12 is needed. ByteDelight.com offers these modified cables, and even a power supply with molex adapters for two 3.5″ floppydrives! If you are going to use a PC floppydrive (3.5″ HD 1.44MB), and you are using HD (high density) floppydiscs for the PlusDlite, make sure to cover the HD hole on the floppydisc with (non-transparent) tape. This will make the floppydrive behave as DD (double density), needed for the PlusDlite.